''ZEUS: made by Italians hands.'' ZEUS was founded in 1984 by a group of friends who wanted to share their experiences in the fields of DESIGN, FASHION and ART. Their aim was to merge and deliberately "contaminate" their ideas under the name of ZEUS, a rather strong and self-assured brand name. This very instinctive initial idea gave rise to a boutique selling its own fabrics and fashion collections, an art gallery presenting Italian and foreign artists, and a minimalistic avant-garde design collection. Today ZEUS is a design brand, self-produced, and distributed worldwide. Its main designers are Maurizio Peregalli , Doriana and Massimiliano Fuksas, Ron Arad, Franco Raggi, and Marie-Christine Dorner. Their choice of materials is industrial and natural at the same time. Linoleum flooring is used to cover tables and consoles. Iron sheet steel, phosphatized and waxed, is used combined with stainless steel: precious materials when used together. The focus is on extreme contrasts as a whole, the strength of stainless steel and the materiality of iron. The collective’s OUTDOOR products with rusty finish and the new collection ‘SLIM IRONY’, combine materiality of iron with old irregular wood, both correspond to ZEUS’ research of rigor and simplicity: subtracting the unnecessary, focusing on specificity of living materials and surfaces to create unique and special pieces. The historical ZEUS headquarter is a large 50’s garage located in Corso San Gottardo, right in the heart of the Porta Ticinese Canals district. 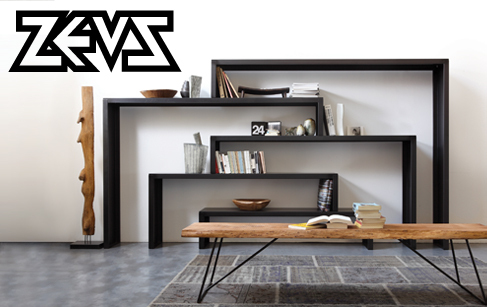 ZEUS has been a landmark of avant-garde and minimalist design ever since it started. During the event "Fuorisalone Design Week" its 1000 sqm. showroom becomes a meeting point between the design world and the city.